We use inexpensive flat steak when we buy it just for the recipe, but use any left over steak. Use either red or yellow onion. Broil or grill the steak until medium rare. When cooked, slice the steak against the grain into very thin slices . The amount of onion that you should add should be equal to the amount of meat. 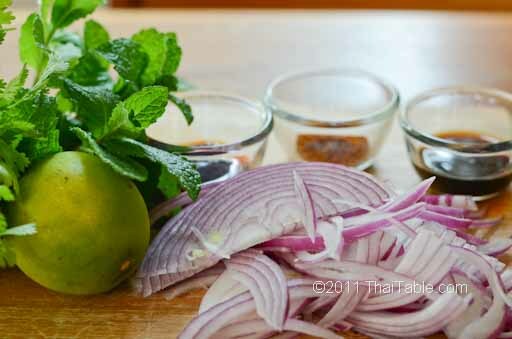 Mince most of the cilantro and the mint, but set aside a few sprigs of cilantro and mint for a garnish. Put the beef, onion, cilantro, mint, fish sauce, chili pepper and nam prik pow in a bowl and mix together. Add 3/4 of a lime and taste. Depending on how sour and how juicy your lime is, you might need more. If you need more lime, keep adding just a little. This dish should taste a little hot, and well balanced between the lime and the fish sauce. Serve warm or cold.